After a long time I created a WCF Service with ws2007HttpBinding which has a complex data model (with inheritance involved). I created the service as usual with the well known configuration and hoping it to work. I just run the application and it ran without any error. Bingo! wow great, I created a service in single go! Now its time to create a client application. The client I was trying to create is MVC 4 web application (which I am most familiar with). The app was already present and I just need to add a service reference to consume my wcf service. As usual I just right clicked the project, clicked on AddServiceReference, entered the service url, given a friendly name to the service and clicked Ok. Wow! I'm ready with a client for my service. 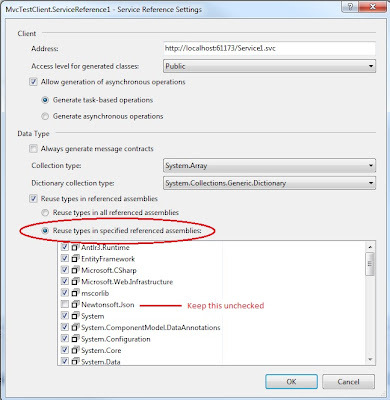 Now its time to call the service method by creating an instance of the client proxy. Being a lazy guy waiting for the visual studio intellisense to show up the given friendly proxy name by typing its initial few letters. Unfortunately, intellisense was not showing anything. OMG! need to wake up now. Whether all my required data structures are decorated with DataContract (classes) & DataMember (properties) or not. Whether the base class is decorated with DataContract or not. Whether the KnownTypes are set or not. Everything was looking fine there but still proxy is not getting created. Frustrating!!! Decided to check the service with wcftestclient (vs command prompt -> wcftestclient -> Right click & click on Add Service -> Enter service url -> ok) tool. Wow, great! it works here. Then, what might be the problem with my MVC 4 application. Just got another thought. 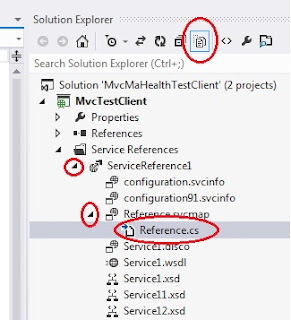 Created a new console application and added the service reference in the same was as I did in MVC 4 app. Amazing, worked with single go. Now the thing is pretty clear that there is something wrong in MVC 4 app. Its time find the solution (well just a google search will do it). 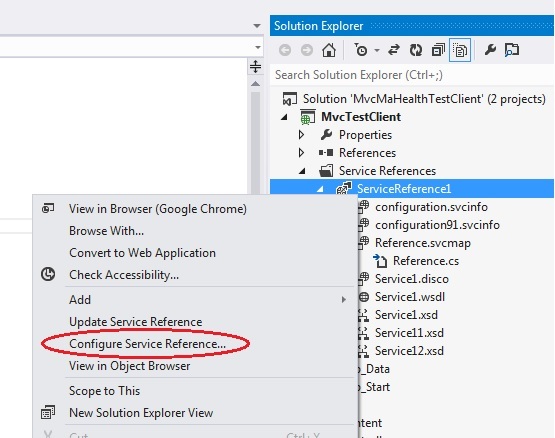 Go to, configure service reference. Thats it. The proxy will be created now. We can do this while adding the service reference itself, by going to the Advanced window. and then stops generating the service reference. Conclusion: Since I am working in WCF after a long time I was continuously thinking that there is something wrong in my service and spent a lot of time to figure it out. Also, I missed one basic step in my tracing with which I could have saved my time (i.e. checking the Error List). Hope this article helps to someone else in future. Out-of-interest, the error list was showing this error & warning. Error:Custom tool error: Failed to generate code for the service reference 'ServiceReference1'. Please check other error and warning messages for details. Error: Type 'Newtonsoft.Json.Linq.JToken' is a recursive collection data contract which is not supported. Consider modifying the definition of collection 'Newtonsoft.Json.Linq.JToken' to remove references to itself. Hope this helps :-) Let me know, if not. Thanks for the post. You have saved me a great deal of time! Thanks for the comments. I'm glad that it helped. Thanks Naveen for posting . i have wasted 2 days on this Issue.. Thanks for the post. It is very helpful. You have saved my life. Thanks a ton. Thanks man!!! this is the life saver,I was stuck in this . Hi Naveen , im new to mvc4 and wcf , now i have to start one project in mvc4 and wcf .i need ur help. 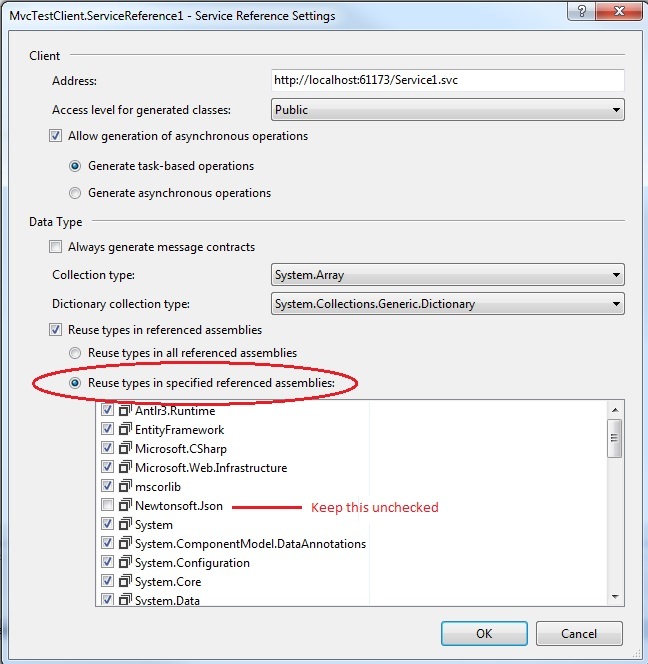 Are you able to generate the proxy using test client or any console application? thank you! days of trying to get past this one have been solved by this post! Thank You very Much I Got Same Problem And I Solve It. Thanks for the link. Will update the article once I get time. Hi, The link provided by Ashutosh seemed to work for me. But what i don't understand is why the normal way of adding a service reference is not working compared to the old way of adding the service. 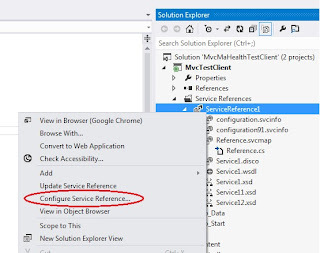 From my knowledge, the new way (Service Reference -> Add Service Reference ->OK) should be easier and better than the old way (Service Reference -> Add Service Reference -> Advanced -> Add Web Reference -> Add Reference) . . . Does anyone know why this is happening? and then stops generating the service reference." It costs under ten dollars for each month, running from four to seven dollars for every month. Are you looking for Web Application Development in India? Kanhasoft is providing Web Application Development services globally to boost your business. Get custom web application solution with professionals.